Another Beautiful Day in Paradise. Well....it was a little windy out of the NE. Absentee Andrew F came and Jeff brought his sister Carol. Welcome all. 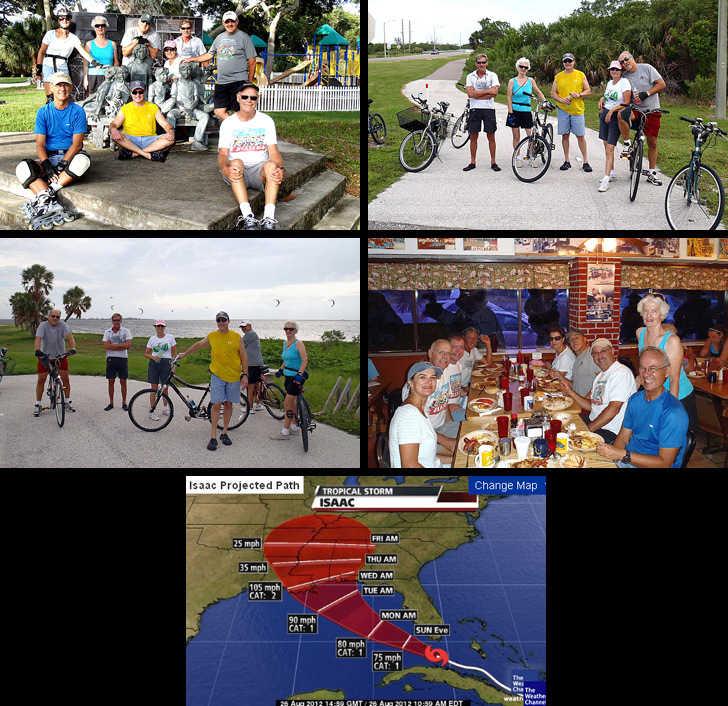 We decided we would do our standard Ft. Desoto route. Head South, do the sub division and go East at the T to the East end and back. As the wind was out of the NE heading South was a snap. Going to the East end was a lot tougher. Heading North back over the bridge was really a challenge. All the 7 bicyclers did the whole 11.9 miles. The two bladers skipped the East end. Looks like Issac won't get here until tomorrow and it doesn't look like Issac will be too terrible. We decided to Brunch again at Skyway Jacks as it is located on the way home for almost everyone. We got seated in just a few minutes with everyone at a big table. The coffee flowed freely and the food was good as usual. Rob rate his meal a 9.5.